ENTITLEMENT POINTS: We know that already the transfer and promotion schedule have been released. Seniority list plays significant role in the counselling. This list includes names according to the points entitled to various categories of schools. General Information Of TEACHERS TRANSFERS. i.e., those with not less than 70% Visually challenged / ortho-handicap./ Hearing Impaired has to produce SADAREM Certificate or Medical Board certificate. V. Kidney / Liver/ Heart Transplantation. f. Applicants’ Children suffering with holes in the heart by birth and undergoing medical treatment available only at specified places to which they are seeking transfers. Applicants with dependant children suffering from Juvenile Diabetes. a. The President and General Secretary of the Teachers' Associations having OD facility in terms at the State and District Levels are eligible for ten (10) points. b. Ten (10) points for un-married Head Mistress, GrII / Female Teacher. a) For the Teachers who are affected by rationalization process they are eligible for 10 points extra over and above already secured. The Teachers who have completed (8) years service are not eligible for 10 points extra over and above already secured. ii) Resource persons conducted training programmes of SSA or RMSA for the last three years. How to know your entitle points? By the clear glance of below instructions, you will get complete idea and you can personally calculate your points without any and strain. Teachers working in IV category schools gets 5 points for 1 year service in that school or 0.416 for every month. Teachers working in III category schools gets 3 points for 1 year service in that school and 0.25 for every completed month. Teachers working in II category schools gets 2 points for 1 year service in that school and 0.16 for every completed month. Teachers working in I category schools gets 1 point for 1 year service in that school and 0.083 for every completed month. Note: The IV category schools will be declared by collector. 10 points will be allotted to teachers different state unions presidents, secretaries those who avail on duty facility. 10 points will be entitled to un-married teachers. 10 points will be entitled for one of them in wife and husband, if one of them is state employee and other is central employee. a) H.Ms can avail these points once for 5 years. b) Teachers can avail these points once for 8 years. Those who transfers as a part of rationalisation they will be entitled with 10 points. No points will be given for long standing teachers (8 years). 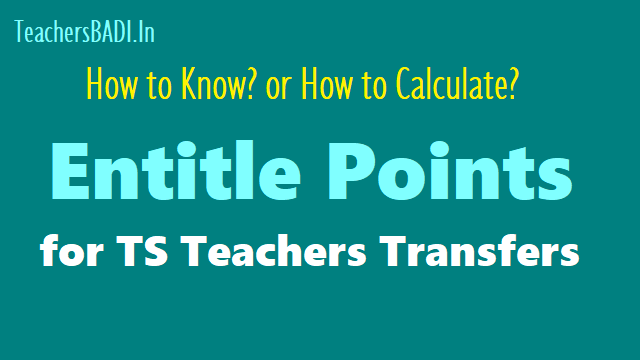 Those who transferred in 2013 but not joined in opted place if their post is shown as surplus post in rationalisation such teachers will be given extra 5 points, the others can join in their opted place after rationalisation. Teachers who wins national award gets 15 points, state level award gets 10 points. Teachers gets below pts through their result in SSC exams. Priority in counselling will be given to the teachers suffers who with 70% of disability, widows, woman who divorced, who suffers from chronic diseases, mentally disable. Blood cancer, jarinal diabetes children’s parents. a) H.M’s can avail this once for 5 years. b) Teachers can avail this once for 8 years. - 0.041 points per month.